If you don’t know this about me, I love a great hotel and am constantly searching for new ones across the globe to add to my must-visit list! Earlier this year I discovered Ocean House, a Relais and Chateaux property in Rhode Island, online and instantly fell in love. So, when May rolled around and Greg and I were contemplating where to spend Memorial Day weekend, I immediately suggested Ocean House and we’re both so glad I did! 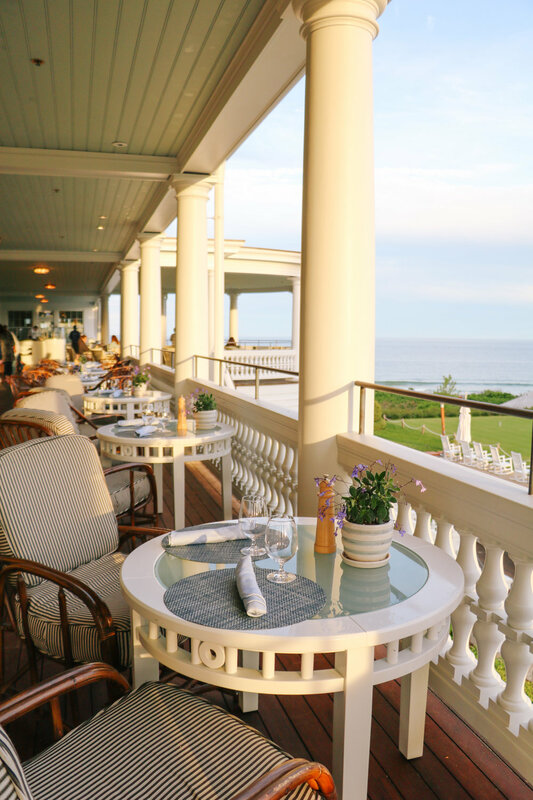 Located on the bluffs of Watch Hill, Rhode Island, Ocean House is an iconic New England seaside resort. The yellow exterior and stunning grounds are what initially lured me in, but once I stepped inside I was even more impressed! With all the luxuries of a Five-Star hotel, mixed with an elegant laid-back atmosphere, you feel as though you’re staying at your own personal waterfront estate. Very Kennedyesque (not to mention Taylor Swift’s estate is right next door!). Boutique in size - there's only 49 guestrooms and 18 suites, most with ocean views - the ambiance is inspired by the hotel's location with "beautifully appointed turn-of-the-20th-century décor, a muted color scheme and early New England artwork". Attention to detail is of no-lack, going as far as having monogrammed pillows on the beds for guests (ours had a "B")! And the staff and service are just as noteworthy. As one of only eleven Forbes Triple Five-Star hotels in the world, Ocean House not only offers fine accommodations, but also numerous amenities from farm-to-table cuisine, an award-winning spa, and complimentary daily activities such as a yachting, tennis, beach cabanas and even a championship croquet lawn (so remember to bring traditional whites if you plan on playing). If you want to venture off property, the quaint village of Watch Hill is steps away, offering boutique shopping and a variety of restaurants serving local flavor (I don't want to admit how much lobster and chowder we ate!). Or take a day trip in one of the resort's complimentary Mercedes Benz house cars with a visit to the mansions in Newport, which is only a 40-minute drive and worth it. The resort was an easy two-hour drive from Boston, where we flew in to, and only 40 miles from the Providence airport. The only thing I wish would have been different during our stay was the weather. With it being the end of May in New England, the days were sunny and pleasant but too chilly to enjoy the beach and it's fabulous amenities, so our next visit will definitely be in the late summer months. One thing to note about Ocean House is it's extremely popular from Memorial Day to Labor Day, with rooms booking months in advance and a 3-night minimum stay during this window. If you're looking to stay here but for a shorter length and/or less expensive rate, I'd recommend visiting in the fall (which would be stunning with the season's foliage!) or in the quiet of winter. No matter when you go, I guarantee it won't be your last visit!